← How could we convert Uzbekistan pdf to bmp clearly? JP2 file format can be thought as the next generation of JPEG.It is very similar to JPEG because they are both compressed image file formats. JPEG is very popular for displaying images and graphics on the internet because of the compressed file size. But there is a downfall to JPEG images due to the compression which has a negative effect on image quality. The more an image is compressed when saving a JPEG, the smaller the file size will be but also the more the quality deteriorates. JPEG2000 files on the other hand can be compressed to much smaller file sizes with far less deterioration in image quality. If you want to convert mhtml to jp2 file format,you can have the aid of HTML Converter Command Line which can be loaded at http://www.verypdf.com/htmltools/htmltools.zip. 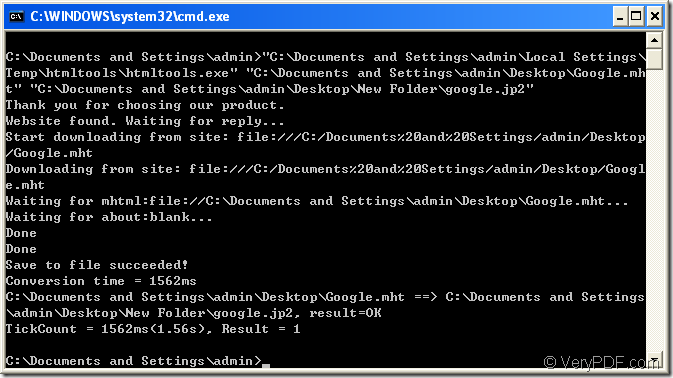 HTML Converter Command Line is a zip file and you should unzip it before using. NOTE:If you want to use HTML Converter Command Line without any limitations,you should register it with the code you get when buying the software. This article will help you to convert mhtml to jp2. First,you should run cmd.exe where you can input commands.Click “start” – “run” like Figure1 and input “cmd” in “open” edit box,then click “OK” button like Figure2. 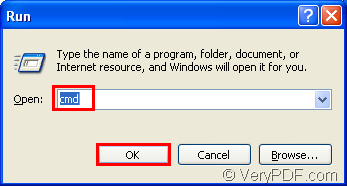 Second,input commands in popup cmd.exe dialog box.The command lines should contain called program,source file and target file.Please see Figure3. 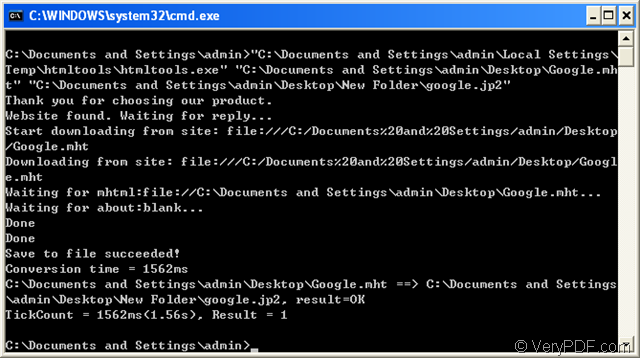 The commands in dialog are "C:\Documents and Settings\admin\Local Settings\Temp\htmltools\htmltools.exe" "C:\Documents and Settings\admin\Desktop\Google.mht" "C:\Documents and Settings\admin\Desktop\New Folder\google.jp2"
"C:\Documents and Settings\admin\Desktop\Google.mht" is the directory of source file—mhtml format file. "C:\Documents and Settings\admin\Desktop\New Folder\google.jp2" is the path of target file,which should be specified by users. 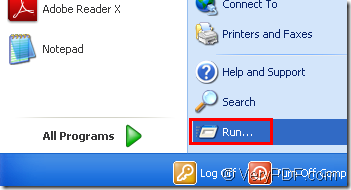 Third,after converting mhtml to jp2,the target file can be found in the location C:\Documents and Settings\admin\Desktop\New Folder.Please see Figure4. You can view or edit the jp2 format file by Photoshop,GSview,IrfanView,etc.